A few days ago it was compatible with Ultrasn0w iOS 6.1, but only for the basebands that could already be released soon, an iPhone 4 and some more for the iPhone 3GS. Now is one of your preferred modifications which has been updated to run on iOS 6.1 and the iPhone 5. Everyone knows that sharing files over Bluetooth is not something that the iPhone allows us to do by default, many users miss, the truth is that I am amazed at how many blog comments. AirBlue Sharing, is perfect for the modification these users, we can send and receive files with other devices using Bluetooth. Add a "bluetooth" to share options of the notes, photos, music and files, etc.. So you can send and receive any file using your iPhone and any other mobile phone or even from a Windows or Mac computer with Bluetooth. Also recommend installing iFile to manage well what we send. It is one of the most recommended modifications to the jailbreak. 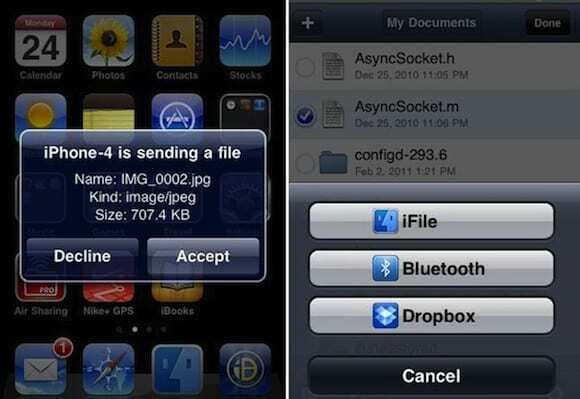 If you need to send files via bluetooth please install it. You can download it for $ 4.99 in Cydia, you'll find it in the BigBoss repo. You need to have done the jailbreak on your device. Article AirBlue Sharing updates made ​​compatible with iOS 6 and the iPhone 5 has been originally published in News iPhone .